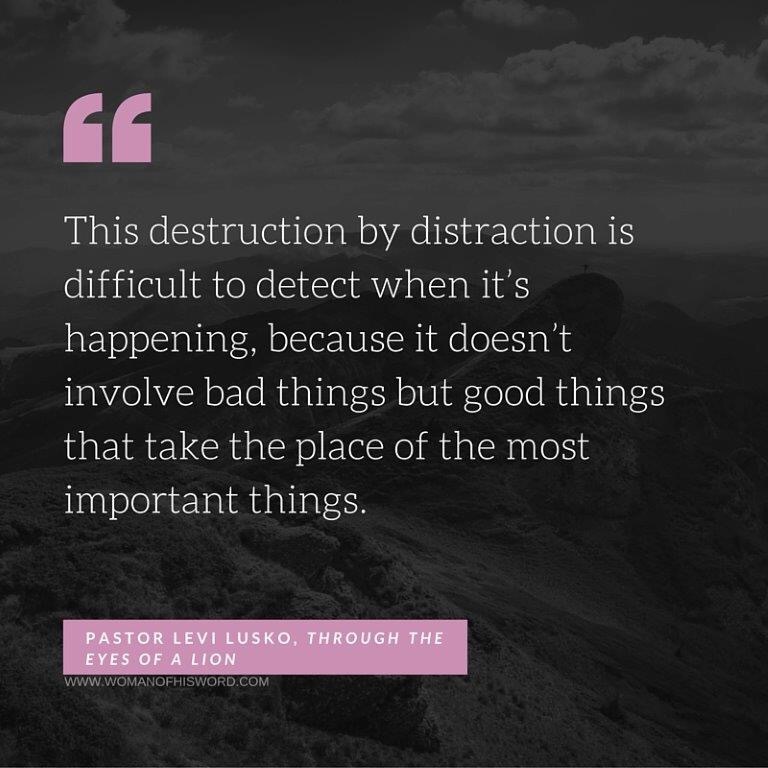 This quote is an excerpt from Pastor Levi Lusko’s book Through the Eyes of a Lion. When I read this portion of the book it struck me like a two-by-four right between the eyes. I never really sat and thought about how the devil uses distraction as one of his vices to destroy us? I usually think of Satan as scheming and conspiring to do evil things such as tearing apart a marriage or relationship; causing lust or hate or anger to stir up inside of us or causing mayhem and terror! I’m beginning to realize that, although these are his ultimate goals for us, he does his destruction in more subtle ways. Can you think of a few things that appear good on the outside but are slowly destroying you on the inside? Can you think of a few ‘good’ things that have taken the place of the most important things? After all, as a Christian, what is the most important thing – spending time with God. The devil is constantly trying to keep us from having a close relationship with God; he entices us with T.V. and entertainment; he tempts us into missing church so we can ‘rest’ a little or ‘spend time’ with the family. When we sit down to read the word or a devotional, all of a sudden he whispers in our ear and reminds us to check our e-mails, view our social media accounts or what about that ‘all too important task’ that must get done this minute. All of these things in and of themselves are good, there’s nothing wrong with television (depending on what you’re watching) or resting or enjoying your family; there’s nothing wrong with checking email or social media – it’s when these ‘good’ things take the place of the most important thing. I admit that I am guilty of being easily distracted; God has blessed me with a creative mind that can do great things for his glory but the devil knows how to use it against me. He knows my constant need to be challenged; my desire to learn and grow and although these are blessings from the Lord, if not kept in proper order it can and has led me astray and away from God’s will. Just writing these blog posts is a constant battle with the devil; I can’t tell you how many times I get started only to be distracted and led astray. Things I haven’t thought of in weeks pop in my head and I often fall prey to his feeble plans and distractions. I am, however, starting to learn how to fight back and I suggest you do the same. 1. Pray even before your feet hit the ground in the morning. There are so many traps and pitfalls that the devil has set before you and it’s easy to stumble into them if you’re not following God’s path. So pray for the Lord’s guidance, ask Him to lead the way and prepare you for what the day may bring. 2. Take inventory of those ‘good’ things that have taken the place of the most important thing. It’s hard to fight a battle if you don’t know what you’re up against. You may not even realize that there are good things causing destruction in your spiritual and even personal life. 3. Pray specifically about these distractions. Acknowledging the distractions and then bringing them before God is the only way to defy the devil and gain victory over them. The Lord will help you conquer these distractions and help you put them in their rightful place. 4. Put the distractions in their rightful place. If you noticed, I said God will help you put these distractions in their rightful place, I didn’t say he’ll completely get rid of them because, it’s not that God doesn’t want us to enjoy the good things in life, it’s that he doesn’t want them taking his place. You must do your part in putting these distractions in their place and allow God to help you keep them there. Each time, before I sit down to write or read His word I pray specifically for God to remove the distractions and help me to focus on His word and hear what he has to say to me and there is no good thing that can take the place of this great thing! Why not start off 2016 by outwitting the devil and his devious plots; destroy the distractions so that they don’t end up destroying you! Are there ‘good’ things currently distracting and keeping you from God and His word? Did today’s post speak to you? I’d love to hear your thoughts; feel free to share in the comments below. Thank you for visiting – God Bless. Wos I believe its not an accident or coincidence that I came across your post. I’m deeply encouraged. I’m a student studying medicine and I must confess the enemy has distracted me by making me put aside my personal time with God because I may not have time to study. But whenever I’m free,he entices me to see a movie because I’m tired and need to relax when I can use that free time to study God’s word or talk with Him in prayer. But he’s surely a liar and I am certain God is liberating me from the schemes if the devil. Thanks Anita for sharing!!! Amen. The Lord can definitely restore and turn ashes into beauty. I will be praying for u as well Lisa. God bless you and your family. i wish i had read this before the devil set up a million distractions most good some bad that took our attention off our son when he needed us the most during his time of severe suffering it was set up like clockwork to take our son down and we were never taught in our churches how powerful satan really is well we now know after its too late our only child was destroyed but maybe its not too late we pray for a miracle for our son to be restored to life and returned alive and well to us its our only hope we have faith that Yahweh will undo the evil that the devil did to our beautiful son and us thank you if you can pray and believe for this miracle for us please from Eric lisa vic savage. Thank you Lisa for sharing your personal experience, I’m thankful that the Lord spoke to you in this post but I’m sorry that it’s through the pain and hurt you’re experiencing. I will say, however, with God it’s never too late, sometimes we have to be stripped down in order to be rebuilt again even stronger. You may also find comfort in today’s Meditation Monday which speaks on God’s strength through our weakness. Thank you for reaching out for prayer, I will most definitely pray for you and ask the WOW community and anyone reading this to do the same. Please keep me updated, I’d love to know how the Lord moves in this. May God bless you and comfort you during this time. Soooo true! There are so many distractions that we allow the enemy to use. Great post, Nita! I’m so blessed to be a part of the WOW community! God bless you! Thank you and thank you for the great recommendation!